What could I enter in the href to properly reference the dynamic about.ejs file? 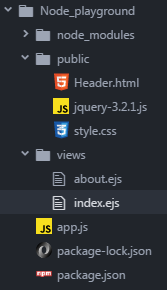 I already know that I can reference static files from my public folder but I want to refernce the dynamic ejs folder. If not possible any solution which provides the same functionality will also do. To open it use /about path.